Such cute puppies! My boyfriend and I are thinking of getting a little pup, too! such little beauties! they are adorable! That is happiness! So cute!! 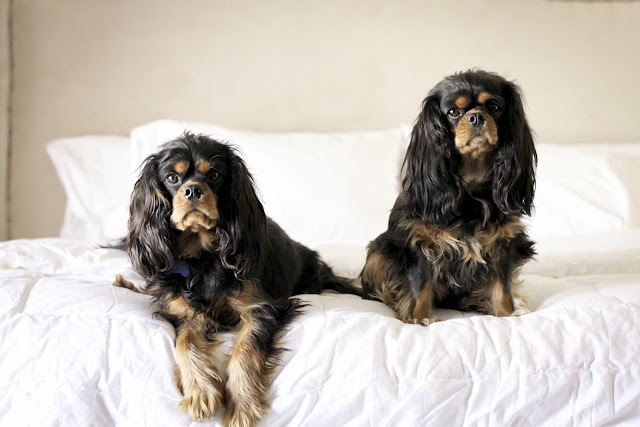 And cavaliers are of course the best four-legged pals around:) Cute pictures! PS Charlie really enjoyed this post, too. Love these pictures. 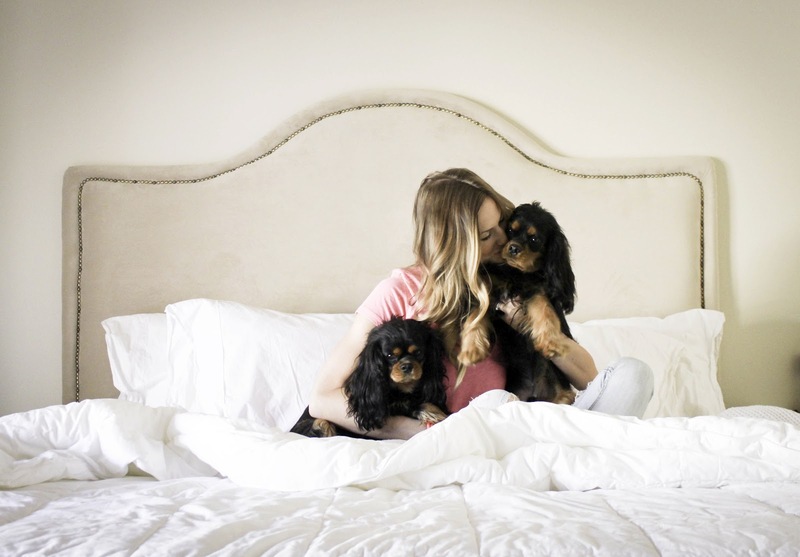 Your headboard is so pretty but your puppies are adorable! Omgosh - this is the most adorable thing I have EVER seen. Adorable! I love my furbabies too! The best! I could not agree with your more! Love your pictures and your four legged friends! I am a new reader and love your blog! Such adorable doggies. Love your blog and your style! such gorgeous puppies! 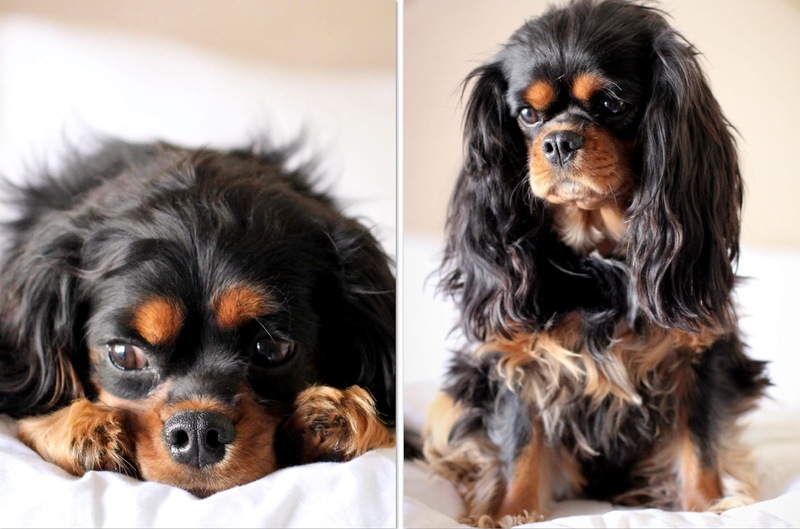 I love cavaliers, actually I think they're one of the most beautiful breeds! So true! They are the best friends to have. I may need a 2nd just so I don't feel so guilty leaving the one alone. fur babies always make life happier! Love these! Dogs make life so much better. Adorable pictures! Those just made my day. I can't wait until my puppy is old enough to come home :) Just a few more weeks! they are adorable :) i can't get over it! i know that my dogs bring me sheer and utter happiness everyday! cute pictures! and cute puppies!! I have 2 puppies and I love them!! what breed are your cute doggies? This is so great! How cute are they!? And that headboard is amazing!! 1. Your pooches are adorable! 2. The DIY headboard looks amazing, I would love if you posted which DIY you used to make it. :) 3. Always look forward to your post! Happy early weekend. You've got yourself a cute pair of snugglebugs! This is just too wonderful! Adorable dogs!! And great pictures. Cutest dogs ever!! My son would go NUTS over them!! I just discovered Your blog a few months ago and it's now one of my favorites. Your posts are so inspiring! they're truly adorable! they make you feel warm and fuzzy inside and they don't judge you! Awwww i LOVE these photos! You have sweet babies!